Yesterday I wrote about my tendency to always get sick at the end of the year. I made the mistake of saying that I've avoided that situation over the last few years. This morning I woke up with a painful migraine-like headache that has kept me exhausted throughout the day. No amount of analgesics, decongestants, running or showering has helped the situation. All I can hope for is relief after a good night's sleep. We have guests staying with us this weekend and this headache hasn't helped my sociability. I'm doing the best I can under the circumstances. I thought a run might help the situation, but when I went out this morning I immediately regretted the decision. After a half a mile I knew it would be a struggle to get through even a three mile run. I had the opportunity to cut it short when I looped around to a road that's close to my house, but I couldn't bring myself to head home. 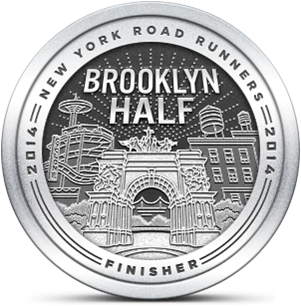 I ran as fast as my leaden legs could carry me. My head was pounding and the relief that I thought might come from aerobic breathing never materialized. 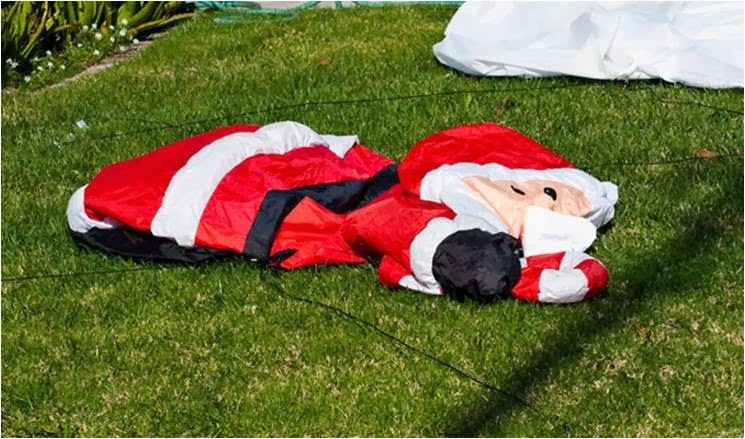 Along the way I noticed how many lawns were covered by deflated Santas and snowmen. Apparently these large balloons are the new decoration standard. I'm guessing that people wait until dark to inflate them as part of their Christmas display. It amused me to see house after house with what looked like colorfully dressed people passed out on the lawn. I was happy to end the run, but I felt no better after the workout. In fact I felt worse. The rest of the day has been filled with activities and my participation has been on the low side. I regret the timing of this annoyance because I only see our guests a few times a year. The Ho Ho Ho Holiday 5K happened today and, because of our schedule, I've had to miss it. I guess that worked out in its own way because I would not have been in shape to race this morning. The Petite Pacer ran it today and I'm betting she had a much better running experience than I did today. oh NO! Well, at least you're not congested or with fever. I'm hoping you feel better tomorrow. Hot toddy time. My race today was mediocre only. A PR for the course, but not the distance. "It amused me to see house after house with what looked like colorfully dressed people passed out on the lawn." I laughed for about a minute and a half from that one. Thanks! Don't you dare call that mediocre! Great job TPP! A course PR is awesome, especially for someone who has battled a bad cold and knee problems. I was thrilled when I saw your post on Daily Mile last night.. I know, I'm such a whiner. I'm grateful for no knee pain, that's for sure. I just chastised myself for being the type of runner I DON'T want to be. I really never want to take myself too seriously. 10 days! I thought I posted a comment earlier....hmmm... Anyway, are you hydrated or maybe stressed? I give you a lot of credit for still getting that run in despite the headache. Hopefully, you're better by tomorrow. I checked to see if your prior comment was trapped in moderation or (gasp!) spam, but I didn't see either. I think my headache was a combination of stress and pressure from the weather change (it went from 30's to 60's practically overnight). After a high carb dinner last night my headache disappeared. Who knew Bagel Boss could cure a migraine? Is 93% of max the magic number?